In a community known for its dairy farms and a setting that includes oceanfront, rivers and bays, it’s no surprise that Tillamook County offers a rich and varied menu of palate pleasers. 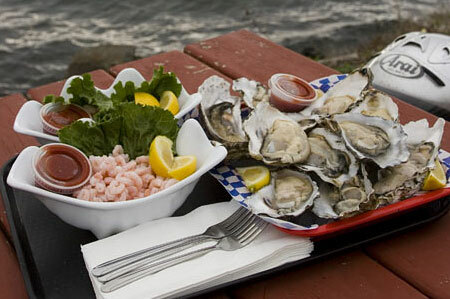 Touted as one of the best oyster shucking operations on the Pacific Coast (as well as the most visitor-friendly) rumor has it that the Pacific Oyster Company also offers some of the Coast’s best chowder. The specialty here is oysters, including five different varieties, each baked in a different sauce, and oyster shooters. There’s also a full service case of seafood to go. When you’re not savoring the seafood, watch production crews shuck oysters to be shipped around the world. There’s only one place you can get Tillamook cheese curds (aka squeaky cheese), and that’s at the Tillamook Cheese Factory. Here you can watch cheese being made, sample from five varieties of curds, treat yourself an ice cream cone or sit down to breakfast or lunch at the Creamery Café. de Garde Brewing boasts the distinction of brewing only “wild” beers. Owner Linsey Hamacher says that means they cool their beer naturally so it collects yeast and microflora from the air. “After we make the beer, it goes into barrels where it finishes fermenting,” Hamacher says. “It can be in the barrel anywhere from three months to three years depending on the variety.” The tasting room is currently in downtown Tillamook, but look for it soon in the brewery in the Port of Tillamook Bay. At the Blue Heron French Cheese Company, you can visit the petting farm, enjoy a sandwich of freshly baked bread or order a custom made basket of goodies for a special gift. The wine tasting room offers more than 120 varieties of wine, while the deli is famous for its Blue Heron Brie, just one of dozens of handpicked domestic and international cheeses featured here.